This small terrier has a topknot of hair on its head and slightly protruding hazel eyes. Longer than it is tall, the Dandie Dinmont Terrier has a large head in proportion to the rest of its body. Its chest is almost as low as its front legs and gets more tucked in as it approaches the back legs. Only dog named after a fictional character! 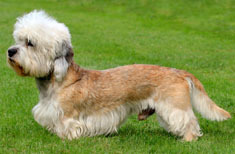 The Dandie Dinmont Terrier ranges from 8 to 11 inches (20-28 cm.) in height. 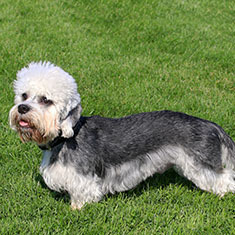 The Dandie Dinmont Terriers can be pepper (born black and tan and eventually turn into silver) or mustard (born dark brown and lighten into red). Dandie Dinmont Terriers shed little to no hair and require professional grooming. Their coat is a mixture of harsh and soft hair, giving it a unique crispy texture. 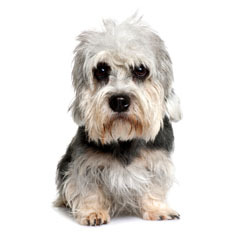 The Dandie Dinmont Terrier requires regular brushing and dead hairs should be plucked as necessary. Dandie Dinmont Terriers hate being babied and would rather be treated as though they were regular sized dogs. Plucky and fun loving, the Dandie Dinmont Terrier can be stubborn and does not like to be obedience trained. This little dog has a big bark for its size and is protective of the family home. Dandie Dinmont Terriers may not do well with other pets unless raised with them from puppyhood. This breed is highly independent and may be reserved with strangers. To ensure health, Dandie Dinmont Terriers should be exercised regularly. They are prone to hypothyroidism, glaucoma and epilepsy. The Dandie Dinmont Terrier can be expected to live about 12-15 years. Dandie Dinmont Terriers should not be let off a leash unless they are in a safe enclosed space. This breed is well suited for apartment living and requires regular exercise to stay in shape. What has a topknot, a scimitar tail, and the heart of a terrier? If you guessed the Dandie Dinmont Terrier, you really know your dog breeds! First registered in the United States in the late 1800’s, the Dandie is one of the rarest of dog breeds, ranking 170th out of 175th in number of dogs registered with the American Kennel Club in 2012. In the United Kingdom, the Dandie Dinmont is listed as a Vulnerable Native Breed with fewer than 300 puppy registrations per year. Dandie Dinmont Terrier is the only breed named after a fictional character! Another distinction enjoyed by the Dandie is that it is the only breed to have been named after a fictional character. Sir Walter Scott’s 1814 novel Guy Mannering included a character named Dandie Dinmont who owned terriers and was apparently based on real-life farmer James Davidson, considered the father of the modern breed. Davidson was the first to document his breeding pairs, allowing him to track pedigrees back far enough to allow registration of puppies. Dandies originated in the border country between Scotland and England, likely a type of Border Terrier or possibly a cross between the Scottish and Skye Terriers. Their original purpose was to hunt badgers and otters. It’s likely the Dandie had a role in the creation of the Bedlington Terrier in the mid-1800’s. This short-legged breed has an elongated body and stands about 8 – 11 inches at the shoulder. They typically weigh between 18 and 24 pounds. Their hanging, pendulous ears are an oddity among the terriers from Scotland. The silky coat is classified as pepper, ranging from dark blueish black to light silvery grey, or mustard, ranging from reddish brown to fawn. In fawn dogs, the head typically appears nearly white. In most dogs, the legs and feet are slightly darker than the body. Although puppy coats may differ from the adult coloring, the final shade is fairly well set by about eight months. Interestingly, breeders should always mate a pepper with a mustard to keep the colors true. The long, low body is distinguished by a topknot of fur on the crown and a long, curved tail that looks somewhat like a sword. The long, low body is distinguished by a topknot of fur on the crown and a long, curved tail that looks somewhat like a sword or scimitar. Large, soulful eyes speak to the Dandie’s confidence, independence, and intelligence. The Dandie Dinmont Terrier can be stubborn, but they do enjoy pleasing their humans. This, coupled with their innate intelligence, makes them easy to train. They get along well with other dogs, and can be trained to co-exist with cats. However, their strong hunting drive makes them inappropriate companions for hamsters, gerbils, and other small animals. Because they will chase anything that moves, and likely catch any vermin that inhabit your yard or home, rabies shots are absolutely required. This is a dog who will be more than happy to greet your guests with a loud bark and a wagging tail, but will be most happy sitting by your feet or even on your lap! They can rest quietly in the house, but are full of energy outside, where they make good Frisbee retrievers. Dandie Dinmonts are patient with children, but should not be left unsupervised around the very young. Young children may be too rough on the dog, whose elongated shape makes him vulnerable to back issues such as slipped disks. Dandie Dinmonts are patient with children, but should not be left unsupervised around the very young. 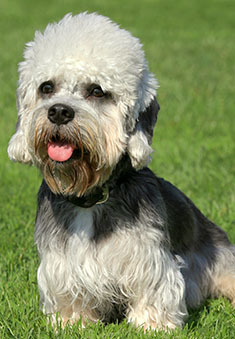 The double coat of the Dandie rarely sheds, but requires some grooming to pull out dead hairs and to prevent matting. Daily brushing can be done with a pin brush, while stripping should be done about every six months with a stripping tool to pull out dead hairs and refresh the coat’s color. As mentioned above, the long shape of the Dandie Dinmont Terrier makes him somewhat susceptible to back injury, primarily disc herniation. In severe cases, this could result in loss of bowel and bladder control or even paralysis, depending on where the injury occurs. Genetic problems are not common in the breed, although there is a slightly higher than average risk of cancer in Dandies. The average life expectancy is between eleven and thirteen years. 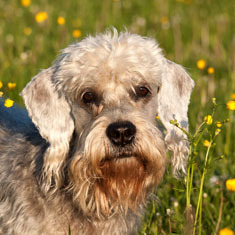 These terriers are fairly hardy overall, but can be affected by hypothyroidism and by glaucoma. Hypothyroidism manifests itself in hair loss, weight gain, a slow heart rate and lethargy. Hypothyroidism is diagnosed by a blood test. It is incurable, but easily treatable with synthetic hormones. Dogs who are free of the disease at 1 year of age can be certified as such by the Orthopedic Foundation for Animals. Ask your breeder to see the certificates of the breeding pair before you purchase a puppy. Glaucoma results from high pressure in the eyeballs, which creates pressure on the cells of the retina and the optic nerve. The high pressure is caused by closure of the angle between the cornea and iris, preventing fluids from draining out of the eye. Untreated, it can lead to blindness. A veterinary ophthalmologist uses a gonioscope to measure the angle between the cornea and iris to diagnose and monitor the disease. Treatment involves reducing the amount of fluid produced by the eye by using a laser to remove the ciliary body. A shunt is often placed at the same time to aid in residual fluid drainage. Should you get a Dandie Dinmont? If you’re looking for a hypo-allergenic dog with a lot of personality in a small package, the Dandie Dinmont may be the breed for you. Grooming is fairly easy, and health issues are few. Because of their rarity, they can be quite expensive, often costing upwards of $1,500 for a companion and even more for a show-quality dog. The one negative with Dandies is their propensity for chasing small animals. Not a problem if you have field mice or other vermin you wish to get rid of, but definitely an issue if you have cats or small rodents as pets. Find Dandie Dinmont Terrier Puppies with our Free Breeder search!